We will ship the cable for free. Then we can see if it will help. Hello, proposed modification, rather than having a volume not to exceed (Geo-fence) it would be useful also to have a line not to exceed, for example behind the pilot, to the right and left far no limits . Bonjour, proposition de modification, plutôt que d'avoir un volume à ne pas dépasser (Géo-fence) ce serait utile aussi d'avoir une ligne à ne pas dépasser, par exemple derrière le pilote, a droite à gauche et au loin pas de limites. Right now the area is meant to be configured always behind pilots. So it should be not where you or other pilots are standing. When landing the Geo-fence should be turned off. Is this how you are using it? 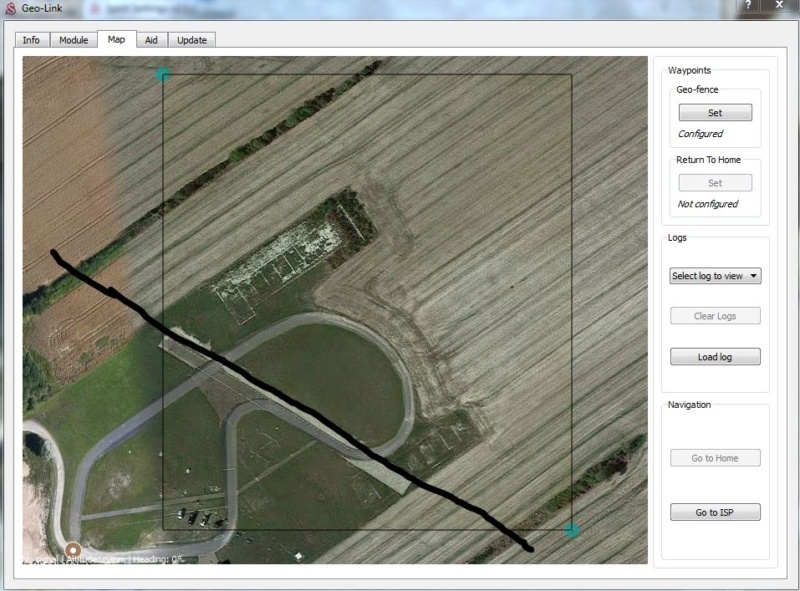 Hello, I do not use geo fence, I can not bow according to the field, I'm waiting for the new version of the program. Hello, cable received this day, no change, the software cuts, the RTH is sometimes erroned, not always it does not go well if we are too far and in reverse, if we advance to the RTH it works well, the floor of Security works very well. Consumption is still false ratio of about 275%. I have no file because no PC in the field, I am forced to cut the power. On the other hand I find the Spirit more "soft" I do not know how to express but since the new version it has changed of behavior in better. Bonjour, câble reçu ce jour, aucun changement , le logiciel coupe, le RTH est parfois érroné, pas toujours il ne va pas bien si on est trop loin et en sens inverse, si on avance vers le RTH il fonctionne bien, le plancher de sécurité fonctionne très bien. La consommation est toujours fausse ratio de 275% environ. Je n'ai pas de fichier car pas de PC au terrain, je suis obligé de couper l'alimentation. Par contre je trouve le Spirit plus "doux" je ne sais pas exprimer mais depuis la nouvelle version il a changé de comportement en mieux. we have developed new firmware and software for checking one possible reason for the problem. It is identical to official 2.5.2 but it has check test whether the unit is running from Backup oscillator or External oscillator. If backup is used, you will see it as the first event in the Spirit flight log. Could you please try to install this software and firmware? It can be tested in minute. This can help us to find why you are having connection problems. Are you using the USB interface right? Do you think you could disconnect your receiver please? So it is powered off. This can help to find if something is causing issue there. If not, then you can at least try to not power your radio on. During testing you can leave it Off. Attachments without power RX, USB cord, indoor only 5 sat. Always 274% ratio for telemetry. Fichiers joints sans alimentation RX, par cordon USB, en intérieur seulement 5 sat. Toujours ratio 274% pour télémétrie. Hello, the erected logged consumption problem is solved, it was a bad setting in the Jeti receiver (Update). A few flights yesterday, the RTH security worked well, the glass floor too, not swayed in inverted flight, but skids down working ok.
Bonjour, le problème de consommation affichée érronnée est résolu, c'était un mauvais réglage dans le récepteur Jeti (MàJ). Quelques vols hier, la sécurité RTH a bien fonctionné, le plancher de verre aussi, pas essayé en vol inversé, mais patins vers le bas fonctionnement correct. En attente de la fonction GéoFence "inclinable"
Hello, I did 4 flights this morning, the RTH did not work, it went away anyhow. I changed 2 receivers, consumption is still wrong, I thought I had solved, no it does not work. Out of 540 ° to the AC vertical tail, the helicopter left strongly on the right side I had difficulty catching it. I have lost confidence, I will dismount geolink and put the old versions Spitit, I am afraid to break my machine. Bonjour, j'ai fais 4 vols ce matin, le RTH n'a pas fonctionné, il est parti n'importe comment. J'ai changé 2 récepteurs, la consommation est toujours fausse, je croyais avoir résolu, non ça ne fonctionne pas. En sortie de 540° à l'AC queue verticale, l'hélico est parti fortement du coté droit j'ai eu des difficultés à le rattraper. J'ai perdu confiance , je vais démonter géolink et mettre les anciennes versions Spitit, j'ai peur de casser ma machine. that is very sad. I am afraid but Spirit is not responsible for precision of the consumption measurement. So it is hard to solve it from our side. Some ESC current sensors are unfortunately not precise always. When changing RPM it could cause differences. But flying in a same style is not a problem for any. Regarding GeoLink did you found out why connection is unstable? It is very important that Spirit Settings software is working stable. So that Map tab is always visible in the software (it is not closing randomly). If not than the same problem will unfortunately appear also during flight. So that Spirit is not getting data from GeoLink randomly, which is not good for correct performance. We could just send you another Spirit unit and GeoLink module to verify if they are working in the same way. Please let me know.